The controversial tournament gained a distinctive Ukrainian flavour in the wake of the Croatia-Russia game. Two of the Croatian victors, defender Domagoj Vida and assistant coach Ongjen Vukojevic, posted a short video dedicating their win to Ukraine. In the video, they said, “This win is for Dynamo Kiev [a Ukrainian football team] and for Ukraine. Go, Croatia!” and chanted the phrase “Glory to Ukraine.” Both men were punished for the video, with Vida receiving an official warning and Vukojevic a fine of 15,000 Swiss francs. Vukojevic was eventually fired. These retaliations were imposed because Fifa bans political actions during the World Cup, and can punish those who break this rule. In response to these punitive measures, thousands of Ukrainians took to Facebook to express their anger. They posted over one hundred thousand one-star reviews on the Fifa Facebook page, and inundated it with comments disparaging the organization, or simply repeating “Glory to Ukraine.” This frenzy prompted Fifa to disable the comment feature on its Facebook page. To add to the diplomatic mess, the Ukrainian parliament discussed the issue in session, with one MP, Andry Pavelko, declaring that the Ukrainian football federation would pay the fine, and invited Vukojevic to come work for him. One of the key elements of the controversy is the phrase “Glory to Ukraine.” While it is a common greeting, the phrase itself is controversial. British media claimed that the phrase was nationalistic, while the Ukrainian Embassy in the UK replied that it was merely patriotic. An investigation conducted by Haaretz shows that the term became popular with insurgent armies who, during the Second World War, used it as a symbol of their ultranationalist and Nazi-sympathetic ambitions to justify the slaughter of Jews and Poles. However, another article in the Kyiv post argues that the phrase originated during the post-Russian Revolution independence struggles, and has nothing to do with Naziism. The issue is complicated further by Russian propaganda that has sought to paint independence-seeking Ukrainians as fascists ever since the Second World War and the increasing power of real neo-Nazi paramilitary groups in Ukraine. The complex history of the region adds new layers to this seemingly innocuous phrase. One line from Vida’s apology, “There is no politics in football,” is rather questionable. The official Croatian Football Federation’s statement on the controversy was equally bizarre, asserting that the two men’s actions “were in no way intended to have political connotations, yet… unfortunately left room for such interpretations.” The dedication of a victory over Russia, which has annexed and invaded parts of Ukraine, to Ukraine, was certainly political. There is no other possible interpretation. The only question is why so many people objected to this political statement. International sporting events do not exist in a vacuum; they are subject to geopolitical forces just as all human activities are. Fifa would do well to stop pretending otherwise. 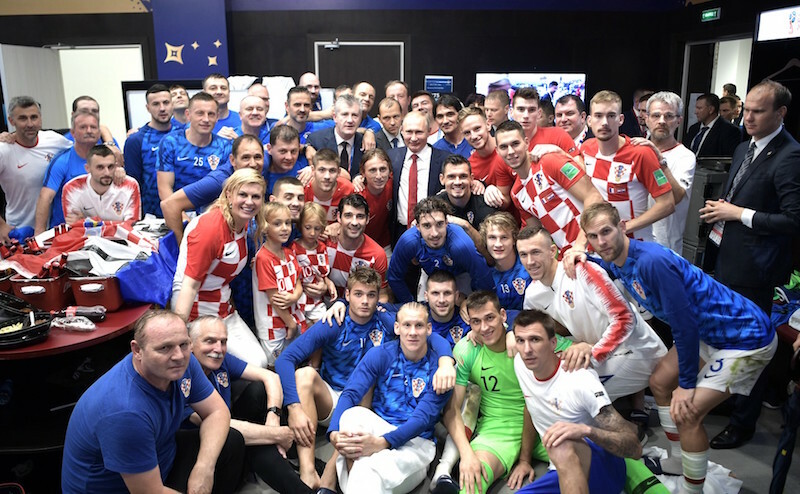 Croatia’s Post-Match Huddle (2018), by Russian Presidential Press and Information Office via Wikimedia Commons. Licensed under CC BY 4.0.